Did you ever notice how the relationship between the characters Veronica (played by Winona Ryder) and JD (played by Christian Slater) in the film Heathers (Michael Lehmann, 1989) resembles that of Xena and Ares in XWP? This paper will explore and compare both relationships. Veronica at the Snappy Snack Shack. Veronica is a popular high school girl who is stuck in a clique of three snobby girls, all named Heather. She desperately wants more to do in her life than make fun of the geeks in the cafeteria and write phony love letters from the captain of the football team to the school's "Roseanne of the Month". 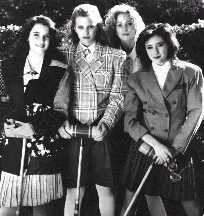 These activities, however, are ordered by the leader of the "Heathers". Enter new student, the stud-ly Jason Dean, a.k.a. JD. JD is a gorgeous "bad-boy" psychopathic looney (and we are not talking any Cry Baby here) who just moved to town with his dad. His hobbies include shouting out smart-alec comments to the jocks and something a bit more interesting: murdering people for the kicks. Veronica develops a major thing for JD. He is evil, but he still sports a totally baby-faced innocent look. He is definitely not the type of boy of whom her mother would approve. Veronica likes that idea a lot. JD knows about her major revenge plans, that she dreams of taking out on the "Heathers", and he offers to help those wishes come true. Veronica decides to "injure" the Leader Heather with a toxic drink. She does not want to do this so she can take Leader Heather's place. She merely wants to get revenge for the way she was treated by Heather. So, with the guidance of JD, Veronica manages to kill Leader Heather. Veronica is terrified. She had no idea "all that paint and toxic chemicals would've actually killed Heather". JD smiles. Veronica hastily forges a suicide note in Heather's handwriting. Veronica at Kurt and Ram's 'suicide'. They then proceed to "just injure" two football players. JD persuades Veronica that he has a gun with "tranquilizer bullets". No dice. The jocks are killed, and that is when Veronica wants out. She writes one final suicide note for them both and tells JD that she and he are through. But JD is not a happy camper. He wants her to stay with him. He wants to wreak havoc and destruction around the world with her. Together, they could make an unstoppable team. He also tells her she cannot leave him. She does anyway. Meanwhile, trouble is brewing up in school. Since Heather "committed suicide", suicide has become a major fad. Veronica realizes that this is what JD planned all along, to terrorize the world with his evil. JD teams up with one of the remaining Heathers, Heather 2. She does not know he is a thundering looney. She just likes his dark image. Also, she is the leader of the school now that the first Heather died. With her help, JD manages to get the entire school body to blindly sign a petition saying that they'll all commit suicide tomorrow together in a blaze of glory, i.e. they'll basically burn to death. The students have no idea what they have signed, and neither does Heather 2. She just likes the attention. Veronica knows nothing of this either, but she does not sign the petition (she has got a "thing" against Heather 2). She also somehow has this hunch that JD wants her out of the way and plans to kill her, no matter how obsessed he still is with her. She fakes her own hanging in her room. JD comes in and sees her, holding a gun. Veronica was right. He does want to kill her, but since he is convinced that she is dead by her own hand, he decides to tell her "dead body" of his evil plan. He intends to blow up the school and all the students during the assembly the next day and how she will miss "a good marshmallow toasting". The next day, everyone is convinced that Veronica is dead. She slips quietly into school and finds JD setting up the bombs under the bleachers and in the boiler room. She confronts him and tells him that he is a psychotic. He says, "You say tomato, I say tomaato". There is a huge struggle between them, and he half orders/half begs her to "come back!". She overpowers him by shooting him three times, but JD is not dead yet. He can still blow up the school, but he does not. He sees that Veronica's through with his evil ways, and he cannot persuade her to come back to him. He blows himself up instead. Ares hasn't given up on Xena quite yet. See the resemblance? The storyline for Xena and Ares was already out there in the late 1980s. 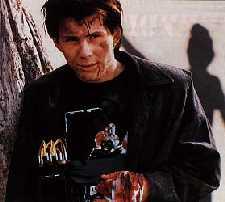 Seeing Christian Slater as a teenage version of the future "god of war" was cool, although he looked pre-bar mitzvah'd without an inch of stubble on that smooth chin of his. 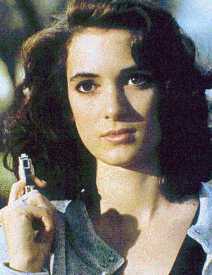 Winona Ryder was her usual feminist-like self. Veronica was born good, was liked by all, and did good things. She meets JD, and she became a murderous, evil b*tch. Xena started out the same way. She then had something traumatic happen to her (some people would call having your village attacked traumatic, okay?) and joined up with Ares, in spirit. That is one of the differences. She did not actually meet Ares in "person" until she had become good again [ THE RECKONING (06/106)]. Veronica actually met her "Ares" and fell in love with him, and she really dug the idea of getting rid of the people she hated. JD resembles Ares because (1) they are both breathtakingly gorgeous; (2) they are not afraid of anyone; and, (3) they like to control people and get them to do their dirty work, namely murder. Ares got Xena to kill people and destroy villages, and JD got Veronica to pull the trigger on the football players, mix the toxic drink for Heather 1, and write all the suicide notes. He planned so many more exciting murders that she could perform for him too, but oops, she discovered that he was a lunatic and wanted out. The only damage he meant to cause himself was to blow up the school, and that was when he was convinced Veronica had hung herself. 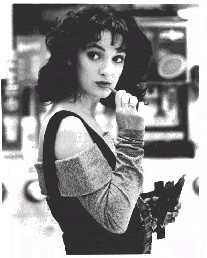 A permutation of the Callisto character also appears in Heathers . Heather 2, played by professional bimbo Shannon Doherty, is a Callisto of sorts, though there are some differences. Heather 2 started out bad, so it was not Veronica who had changed her, as Xena had done to Callisto. Heather 2 always admired JD from afar, and she jumped at the chance to get even with Veronica (and jump in the sack with JD). This is the same as with Callisto and Ares in INTIMATE STRANGER (31/207). Another difference between Xena and Veronica is that Veronica "left" the Ares-like JD by discovering, on her own, that he was psychotic. Xena became good only after Hercules laid out the pros and cons (and the pros of being good were better). 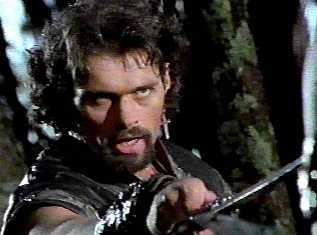 Perhaps Xena did not really need Hercules' "help". Perhaps she would have became good on her own, as Veronica did. One clue to that is her trying to persuade Darphus to spare women and children, and another is rescuing the baby from the burnt-down village and handing it back to its father afterwards [ THE GAUNTLET (H12/112)]. Another obvious difference is that when Xena became bad, she was hated and feared by the world. When Veronica became bad, no one knew about it. She covered up the murders with forged suicide notes. No one knew that JD was evil either. Veronica was also never hated or feared by the school body. She was always popular, even though she did not hang out in the "Heather" clique anymore. She had already made a positive name for herself. Xena made a positive name for herself only after she made amends for her evil deeds. Although most people think Heathers is just about a boy and girl who fall in love (or in lust) and gleefully get rid of the people they hate, this article has explained that it is much, much more than that. JD is Ares, and Ares is JD. They both have the same character essential character traits, the same ambitions, and both spew certain emotions that they cannot control, ranging from jealousy, to frustration, to violent tantrums. They wish to control the world, although they do not desire to do it alone. They yearn for a companion to support them, carry out their demands, and fulfill their needs. Both express their inner child, i.e. both are young boys who have no self-control. Both are sons who are somehow neglected by their fathers, thus left to control their lives alone, without learning social values and respect for the outside world. Both are war-lovers within themselves. I'm a 16 year old high school student from Israel. I enjoys watching, analyzing and commenting on XWP, surfing the Net and writing articles. I'm a youngin', I know, but I'm still learning the ropes! As for more common hobbies, I enjoy reading anything by Stephen King, listening to music (mainly Boyzone, Bon Jovi and..er..West End Musical recordings such as Les Miz or Miss Saigon ), and spending time with my friends. I am an avid fan of XWP and HTLJ and have been watching both since they started. I am a much bigger fan of XWP, though, and have every single episode on tape.